The advent of the anthropocene age has mobilized many artists to address environmental issues, as, climate change, water and habitat loss. Artists who work with science and scientists have been acutely moved by the scale of disaster many feel we are facing. This article explores how ecological artist, Aviva Rahmani pro-actively addresses these issues with a theory about environmental restoration grounded equally in art and science. By Aviva Rahmani, New York (USA). Trigger Point Theory is this artists’ answer to ecological crisis. It initially emerged from my practice as an ecological artist as a series strategies to cope with what has felt increasingly like heart-rending environmental loss on a global level. What began as intuitions became formalized during the creation of the Ghost Nets (www.ghostnets.com) ecological art restoration project to address threshold change. My particular interest has been in re-establishing the ecosystem buffer zones that filtrate clean water, known as ecotones because I think they are the key to habitat fragmentation and water degradation. The National Research Council (NRC), defines restoration as the „return of an ecosystem to a close approximation of its condition prior to disturbance.“ (Restoration of Aquatic Ecosystems 1992) The goal of restoration in the work of Trigger Point Theory refers to fostering environmental conditions that support native communities of plants and animals. Threshold change is that point when ecological systems are so degraded by disturbance that they collapse irretrievably to another state. All of this, I believe can be addressed as challenges to our notions of what art can do and that is what my body of work struggles with. As a performance artist, I chose a former coastal town dump on a fishing island as the site to test Trigger Point Theory after a grand tour of travel and walking that began 1979 and continued for ten years. I began by studying and contemplating maps of Europe and the United States to understand what was happening with water resources and indigenous populations. At the end of that decade, I had visited many sites as possible locations to establish myself in a community as one step towards a public art work and decided we were facing a “decade of (environmental) choice.” Eventually, I narrowed down my interest to the North East sector of the United States and then even further, to the former dump site on Vinalhaven Island, Maine in 1989. There, I made my home while restoring the land. My first task was to create the physical structure to continue performing: performing ecology. I made stroll gardens over the entire property to both guide the water towards the buried estuary at the base of the land, where the last part of the restoration would take place, and to use the paths as walking-meditations. The role of these meditations was always to deeply consider how parts fit together in the puzzle of large ecosystems and where the human body fits in that puzzle. The layout of the paths was concentric around a small quarry pool on the site. The design of the stroll gardens was inspired by Native American Medicine Wheels, with elaborate relationships designed between color, scent, forage for animals and garden “bones (trees and rocks).” Each day, it took me an hour to walk the garden paths ritualistically, in a state of mediation, in various seasons, and consider the ecosystem changes that took place as the site transformed, transforming me too. The walk began in the East, passed through the South, West, North and ended in the East again. At the end of seven years of these walks, I began to have some insight into how ecosystems function that could never have come from books alone. Several of the central tenets of Trigger Point theory are organized around protecting water systems while generating art events. Sequentially, regions are analyzed with mapping techniques, including Geographic Information Systems science (GISc), which allows the layering of various data with queried geographic spatialization. This analysis yields information about large landscape features in relation to other species as well as the vegetation that protects water, which in turn allows me to create extensive and complex buffer zones of porous surfaces that support a range of ecosystem health. That analysis is always punctuated by long periods of contemplation during which time artifacts emerge. Artifacts include paintings, installations, films, audio and other materials. These artifacts are as much a focus for further meditation on the site as a product of my meditations. The first seven years of Ghost Nets were devoted to these walks, my place in the community and preparation to daylight (daylighting is the process of unearthing water systems that have been buried by human industry) the buried estuary that climaxed that long period of front loading the public restoration with artmaking. When the daylighting took place, it fulfilled another set of Premises from Trigger Point Theory: to choose the smallest possible site in a degraded area and catalyze an efficient effect. The bioengineering was completed in four days in 1997 on 1335 m² of the larger site. But that small size wetlands is typical of the entire upper half of the Gulf of Maine and serves the animal community that includes fisheries and migratory birds for the entire region in critical ways. My strategy was efficient in that despite the enormous investment of time, the final work was targeted, minimalistic and effective. 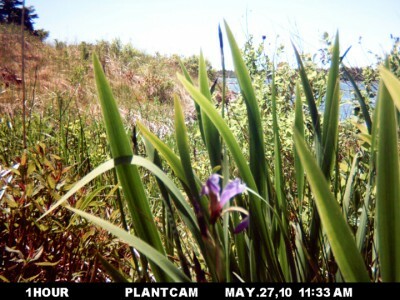 Proof of effectiveness came when the Wells National Estuarine Research Reserve monitored the health of the site in 2000. Historically, Western art has reflected a view of the world in which humans act upon nature to control it. The visual arts followed suite by producing objects we can move around like furniture, much as coal extractors move around mountain tops. Today, the complex feedback between human action and response creates unpredictability. Arguably in response, much of the art world has abandoned the controllable object for other means, as new media.GISc and performance art, including the use of visualizations and metaphors alongside web platforms and live workshops are ways I address unpredictability and hope for the natural world. My general aim is to address restoration questions from a larger perspective with the expanded tools of art. This integration of art and science tests the cumulative power of combining both to address environmental instability. This is activist art. In “Design by Nature,” Ian McHarg (1969) saw restoration as a mission of Landscape Architecture to countervene the landscape degradation caused by Manifest Destiny as articulated in the King James translation of the bible. In contrast, earlier versions of the bible, as with contemporary indigenous societies globally, reflected how Semitic pastoral tribes recognized our interdependence with all life. In our day and age any countervention to ubiquitous degradation and specism is activist. The activist premises of Trigger Point Theory are a performative analysis, positioning my arguments for the function of a holistic ecosystem in the „nature’s rights,“ (Cullinan 2002, Shiva 1988) movement, conflating social justice and animal rights. The question arises, where is the art in this science? Artists and scientists have long found each other’s disciplines both useful and fascinating. Restoration ecologists routinely refer to the “art” of their work. Restoration as art, by an artist, is less frequently claimed. But it is no accident that both science and art require meticulous dedication to observing the natural world (albeit in contemporary terms, “natural” is a relative term). The classic examples of Leonardo Da Vinci’s inventiveness and Johann Wolfgang Goethe’s work on color stand out amongst the many artists who more modestly signed on to illustrate the discoveries of scientific colleagues, to chronicle their personal obsessions, as Vladmir Nabokov’s with butterflies, to experiment, as Robert Rauschenberg’s in Experiments in Art and Technology or those scientists, as Charles Darwin, who documented their own observations with competent draughtmanship. My personal claim is that walking deeply into science is in itself a performative exercize for any artist. It has been a daunting but necessary test of where my intuition has taken me. The wider background to my researchis the problem that humanity is poised before unprecedented ecosystem collapse due to anthropogenic activities. My practice as an ecological artist presumes a human responsibility to systematically „clean-up“ anthropogenic environmental damage and address species loss. Mierle Ukeles was one of the first ecofeminist artists to position herself as a “Maintenance Worker,” establishing herself as artist in residence with the New York City Department of Sanitation in the seventies. Housekeeping, husbandry of and cleaning up the environment are homely terms I reference and parallel with other healing metaphors as another essential aspect of Trigger Point theory. Such acts of “maintenance “ on our planet earth constitute what I call environmental triage: strategic choices to intervene in over-whelming ecodisaster. I see this as both a literal and metaphorical task to “clean up,” after ourselves. The metaphorical allusion in the naming of Ghost Nets, was to the indestructible fishing nets that drift loose of boats and continue to destroy marine life, like human habits and routines. The persistent allusion in Trigger Point Theory, is to the tangled anthropocene web we have made of environmental degradation that needs to be unraveled. Another Premise of the theory is that we must confront dramatic change in ourselves, our habits of thinking and acting to cope with what we have created. And free ourselves. My experience of trying to write about the scientific basis for these intuitive observations that originated Trigger Point Theory certainly forced change on me. It taught me to stand back from my own thinking and expectations dispassionately. My research proceeded from several simultaneous perspectives:as systems theory, as an approach to environmental restoration, as a set of guidelines for environmental modeling and as an aesthetic analysis of ecological performance art. Establishing the credibility of the various elements of Trigger Point Theory has been my research priority. I found substantiation, for example, for my Premise to start with a small intervention from the practice of nucleation primarily in tropical forestry restoration: the practice of seeding small areas of degraded regions with indigenous vegetation, where remnant plants can be found. Monitoring for change is always critical in the sciences. In my documentation of how Ghost Nets “cleaned up” a small patch in the Gulf of Maine. I created the film, “Resurrection/ Desecration.” Spring at the restored marsh that was part of the Ghost Nets project, was juxtaposed in a time lapse film, with the BP spill in the Gulf of Mexico at the same time in 2010. I began serious research for my PhD, with Z-Node, University of Plymouth, for “Trigger Point Theory as Aesthetic Activism” in 2009. By then, I understood that my problem was not going to be to prove I was right. Rather, I would be exploring the literature for “null hypotheses,”(evidence that the hypothesis would fail) to see where and how I might be wrong. The possibilities were manifold. But what was stranger to me as an artist, was that to even begin my research, I had to go backwards in time in my intellectual evolution and deconstruct one piece of my thinking at a time. As an artist, my thinking has always proceeded by small and large leaps, captured in one artifact of meticulous realization or another. In the world of science, I began to learn, my artifacts and how they were created were like laboratory assignments. But to present them as proof of theory, I had to break down, record and precisely follow each part of each sentence of thought not only against other scientists but against my own process, so logic might be perfectly replicated for endless repetition and verification. The two methodologies for recording observations are worlds apart and possibly inimical. In the case of the artist, thinking is not only intuitive and internalized but often deliberately secretive. There is no expectation of replication by others unless, idiosyncratically, cultural appropriation might be an end result. In the sciences, replication by others is essential to credibility. This is, particularly true in the hard sciences, which I began to have more than passing acquaintanceship with when I began studying GISc at Lehman College, City University of New York in 2010. I decided to tackle GISc in a certificate program as a means of shifting the basis of my research from a subjective hypothesis to one that might bear up under external criticism without compromising the experience of generating artifacts intuitively. The research task I embarked on in my GISc work was to begin analyzing data assembled by Wells National Research Reserve (Wells NERR). 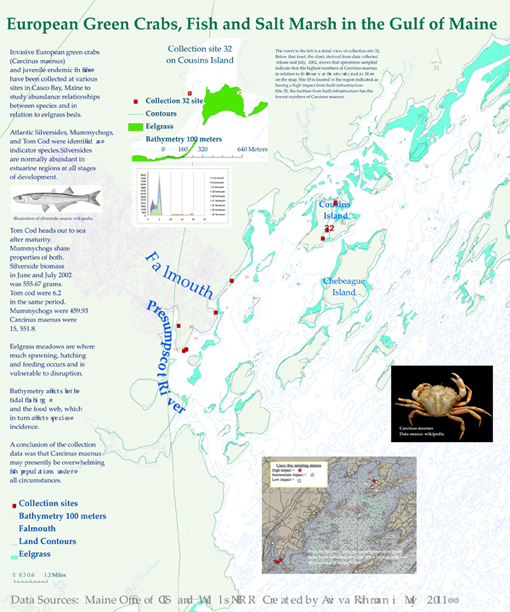 That data collection compared species abundance at a number of sites in the Gulf of Maine. My interest in that data had been sparked in 2000, when monitoring the Ghost Nets site with fyke nets, we captured a haddock with a green crab (carcinus maenus) in its stomach. The relationship between fin fish and green crabs is of primary concern on both coasts of the North American continent because these crabs, an invasive species, appear to be decimating endemic fin fish. Our discovery of the haddock begged the question of what relationship there might be between various salt marsh characteristics and the food web. The question is relevant because it might predict where to target environmental triage to leverage Trigger Point Theory. The Ghost Nets site thus became paradoxically as much a prototype to observe yet another system facing threshold collapse as a model for successful restoration practice. Figure 2: GISc mapping of the relationship between small patches of eelgrass in the Gulf of Maine and probability of survival of fin fish species against invasive european green crabs. Contemporary science relies heavily on creating mathematically derived models, GIS is one way to make a model. Many people are now experimenting with agent based models (ABMs), one class of models, because they offer ways to predictively calculate probabilities to include risk, error and unpredictability. A part of creating any model is often to include “Rules” which are taken from the experience of people who might not have conventional credentials in the field of inquiry. Rules based expert systems supply external data to models, as, fishermen, artists or other scientists. An aspect of my research experiments with performance as a source for Rules based expert systems. In conclusion, I am finding the boundaries between art and science as complex and interdependent as the study of ecotones, those various zones between water and dry land, essential to applying Trigger Point Theory in coastal regions. Making generalizations about modeling environmental restoration, for example, requires systematically tracking back, not only from the observations I make as an artist but forwards in the context and language of my scientific colleagues. The strategies of the Green Belt Movement, Greenpeace and 350.org. none of which are artist’s groups, exemplify a trajectory of outreach that successfully bridges restoration-conservation work, elements of performance art and scientific grounding that don’t require these kinds of meticulous deconstructions. But it might be said that they do depend on “parsimonious” thinking to achieve their outcomes. Parsimony, as defined in classical science, refers to a goal of achieving an elegance in problem solving which reduces complexity. The demarcations between these approaches and effects are not always simple. As artists, we mix and match with abandon to produce results that fulfill our intuitions of what will make powerful commentaries. In the world of science, my reasoning gets broken down into Boolean logic, that algebraic approach which is so clearly this or that, Bayesian logic, which requires a hierarchal relationship to probabilities of outcomes or fuzzy logic, which is predicated on inexactitude. These demarcations can get as fuzzy as the fuzzy logic that often informs GISc predictive modeling. In our age of uncertainty, these distinctions, like a pack of playing cards shuffle and reshuffle perception as we all continue to wrestle with the unfolding future we have generated. Der Beitrag wurde am Sonntag, den 17. Juli 2011 um 11:48 Uhr veröffentlicht und wurde unter English articles abgelegt. Sie können die Kommentare zu diesen Eintrag durch den RSS 2.0 Feed verfolgen. Sie können einen Kommentar schreiben, oder einen Trackback auf ihrer Seite einrichten.